On Sunday, February 21st, 2016, KPPI team served in Pesawaran Subdistrict, Lampung, Sumatera. 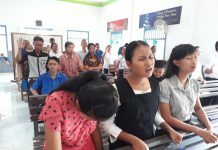 Where KPPI cooperated with GKSBS church which is a combination of 3 posts of GKSBS Candimas, GKSBS Margomulyo, and GKSBS Trimulyo which is pastored by Rev. Koko Sumarno. Worship started at 3.00 PM opened by Rev. Koko Sumarno who led in prayer and praise with excitement. All the congregations praise God earnestly. Most of them who were present were farmers. Followed by preaching Word of God delivered by Rev. Boston Silalahi (KPPI Team) taken from Mark 10: 46-52 concerning blind Bartimaeus who cried to the Lord Jesus even though the people around him told him to be silent. But he remained faithful to the Lord Jesus and God saw the faith of this blind Bartimaeus and healed him. When the servant of God invited the congregations to believe in the Lord Jesus then whole of them wanted to believe in the Lord Jesus as their Lord and Savior. Thank God! 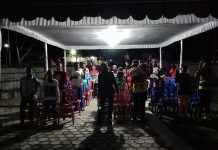 The event was continued with the prayer of healing, the servant of God invited the sick to be prayed by the servants of God and the counselors, then there are about 15 sick who came forward. Praise God in that afternoon, there were 3 people that God cured from gout, legs which were difficult to be moved, and breathless. 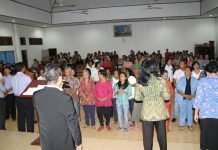 Truly the Lord Jesus has not changed, God has performed miracles to His beloved people in Pesawaran, Lampung. Hallelujah!